Vintage - Karlovarsky Porcelain (formerly Hass / CZJZEK) Demitasse Tea Set, 17 Pieces, Circa 1950's. Beautiful Demitasse Tea Set by Karlovarsky Porcelain of Czechoslovakia, Formerly HAAS. Pattern #CZJZEK. This is a 22kt Gold and White Set with the Whole Lip of Plate in 22k Gold, Center is White with picture of a Man Kneeling, Proposing to a Lady. A very Striking Set because of all the 22kt Gold. There are 17-Pieces which include 6-cups, 6-suacers, 1-Coffee Pot w/ Lid, 1-Sugar Bowl w/Lid, and 1-Creamer. We've never seen another Tea Set with as much 22kt Gold. In great condition. Beautiful Demitasse Tea Set by Karlovarsky Porcelain of Czechoslovakia, Formerly HAAS. Pattern #CZJZEK. This is a 22kt Gold and White Set with the Whole Lip of Plate in 22k Gold, Center is White with picture of a Man Kneeling, Proposing to a Lady. A very Striking Set because of all the 22kt Gold. There are 17-Pieces which include 6-cups, 6-suacers, 1-Coffee Pot w/ Lid, 1-Sugar Bowl w/Lid, and 1-Creamer. 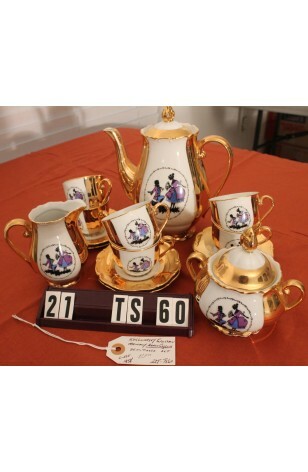 We've never seen another Tea Set with as much 22kt Gold. In Great Resale Condition unless noted below or in pictures. 6 - Saucers - 4 3/8"